Monday March 18 1907 I was busy all forenoon with the work and I had to watch my hens that I had set. I went to town at 1.37 Did a few errands and went to see Dr Smith about my throat and ears. I will have to go twice a week for awhile to take treatment I cam home at 3.20 Did evening work. Tuesday March 19 1907 The man came from town this morning to saw the wood I baked bread and thought they would be here for dinner They got done at 10.30 and going on up to [Franholz?] took Billy with them. Will worked the [illegible] in afternoon and I went down to Mary Woolfs to spend afternoon. 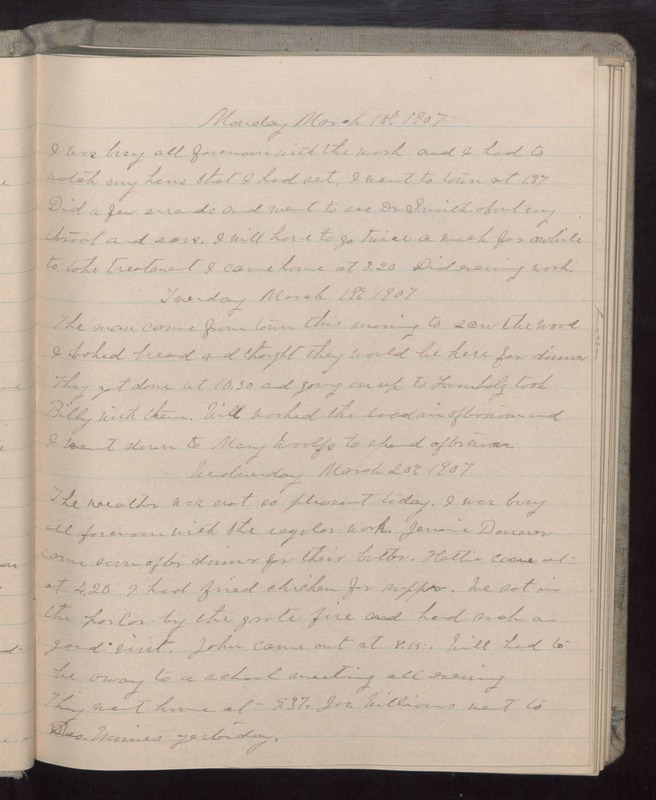 Wednesday March 20 1907 The weather was not so pleasant today. I was busy all forenoon with the regular work. Jennie [Donover?] came soon after dinner for their butter. Hattie came out at 4.20 I had fried chicken for supper. We sat in the parlor by the grate fire and had such a good visit. John came out at 8.15. Will had to be away to a school meeting all evening They went home at 9.37. [Jer?] Williams went to Des Moines yesterday.